If you think it's hard to learn how to use rub-ons, think again. What seems like a daunting task is actually very simple. In fact, all you have to do is treat rub-ons like stickers. It’s just the way in which you attach them to your scrapbook layout that's different. But before we get to how to use rub-ons, let's take a minute to figure out exactly what a rub-on is. The only thing I can really compare them to is a mix between Colorforms and Shrinky Dinks. They're paper thin and aren't sticky to the touch, but they stick like any sticker would with a little "rub." Rub-ons can be alphabets, sayings…any variety of things that you would expect to find in sticker form. So, what can rub-ons be used for?... Well, anything that you might use a sticker for with a few modifications. You can use them for titles or as part of an embellishment. For example, you can adhere a rub-on to the top of a big brad or piece of chipboard. The great thing about rub-ons is that they don't get "sticky" until you want them too. Now, you're probably still wondering, well how do I use a rub-on? Again, it's easy, just follow these steps and you'll be on your way to enjoying the added flexibility that rub-ons provide. As with anything, you will want to gather your materials before you get started, so once you do get going you don't have to stop if you get on a creative roll. To work with rub-ons, you will need your rub-ons, the item (tag, layout, etc.) on which you would like to adhere the rub-ons and your rub-on tool. In most cases, when you buy a pack of rub-ons, you will be provided with a very sophisticated tool with which to attach your rub-on...it's called a popsicle stick! You may also get something that looks like a cuticle pusher from a manicure set, but I like my metal rub-on tool. The one that I have actually doubles as an embossing tool, but that's another discussion. In all honesty, there is no one tool that works better than the other. All you really need is something that will smoothly rub the image onto your paper, brad, etc. So, let's get on to learning how to use rub-ons. When you open up a pack of rub-ons, you'll see that it's very similar to wax paper...wax paper with images. There are two layers - one with the image and one protective sheet. If you feel the rub-on, you'll notice that it's not sticky like a sticker. One of the advantages rub-ons have over stickers is the amount you usually get in a pack - instead of just getting one, or maybe two, of each letter, you get 10. They also come in a variety of colors, sizes and fonts. 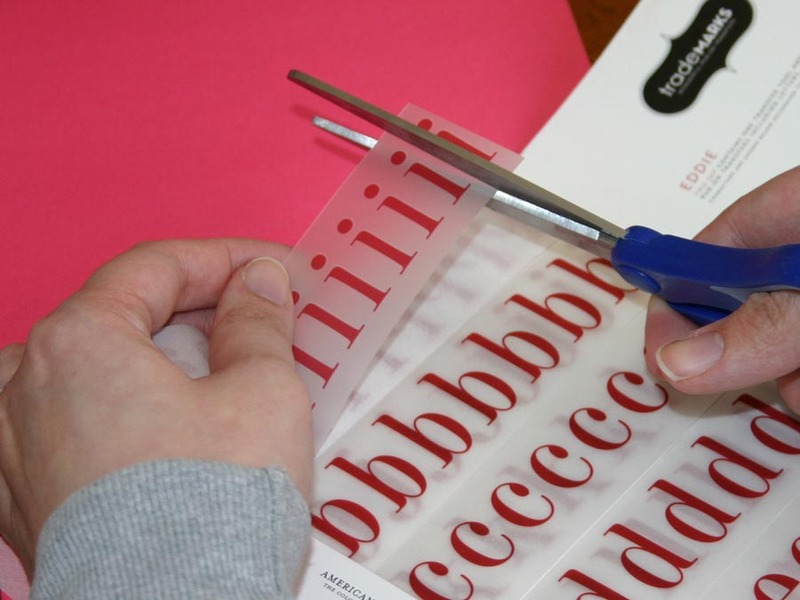 Now, in order to make your life easier, you will want to cut the letters out that you want to use from the sheet. NOTE: You don't need to cut the protective sheet - only the layer with the actual image. Why?... 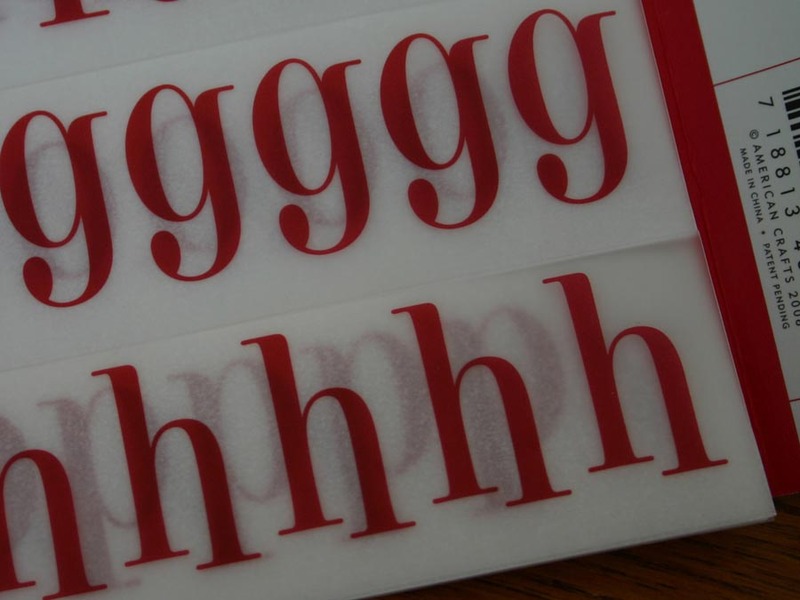 This will allow you to place the rub-on exactly where you want to without the risk of rubbing more than one letter onto your layout (they are placed very close together, so the possibility is there). Once you have placed your rub-ons where you would like them, take your super-specialized tool (a.k.a. popsicle stick) and rub the image with it. You don't have to rub very hard - just be consistent. As you rub, you will notice that the image will separate from the wax paper. Once the image is completely separated, your rub-on has been successfully transferred to your layout, tag, brad...whatever you happen to be adhering it to. The last step, depending on what you're adhering your rub-on to, is to finish with embellishments. 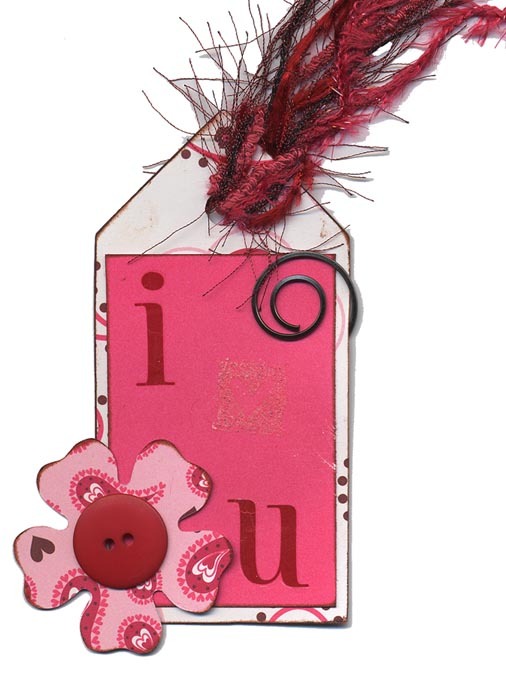 In this example, I was making a Valentine's Day tag. 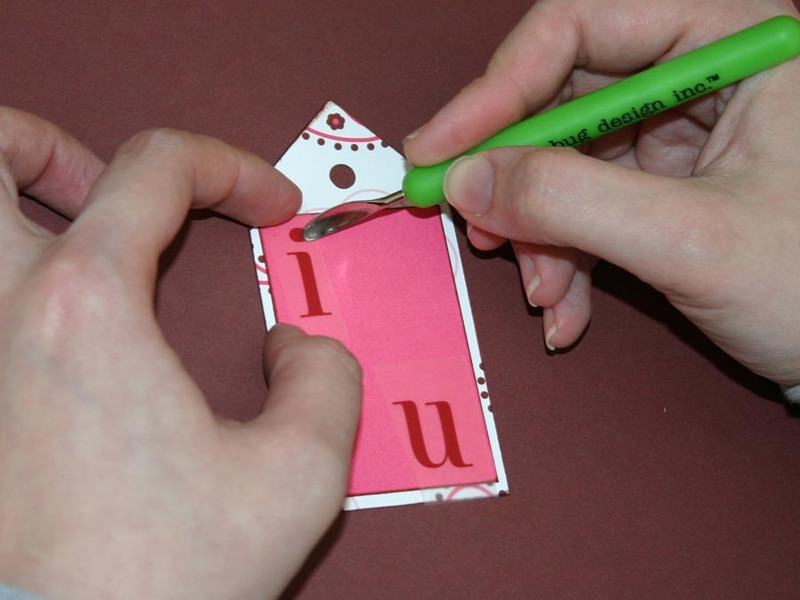 I used a rub-on for the "i" and "u" in "I Love You". 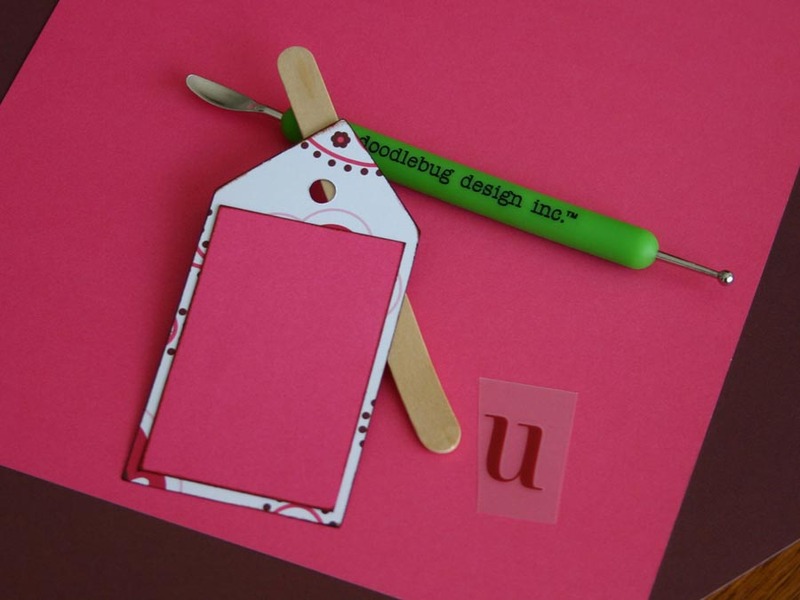 As you can see, learning how to use rub-ons doesn't require a Ph.D. in scrapbooking, just popsicle sticks!